Each of us has his or her reasons for participating in this sport called audiophilia, but for some, the end is not as important as the means. Take my friend Ivan Sesler, for instance. Ivan came late to the world of high-end stereos, but once he dug in, he went off the deep end -- not in regard to cost, but in true, all-out dedication. The out-of-this-world prices of some high-end audio gear simply floored Ivan. He failed to see the value in such an extravagance as speakers costing upward of $1000 each. Ivans answer was to build his own. After all, its only MDF and some drivers, right? When his first attempt didnt go so well, I told Ivan about crossovers and the principles behind them. Ivans Version 1.1 was obscenely bright, but a couple of resistors brought the level of the tweeter down to a reasonable level. V.1.3 received a port courtesy of a hole drilled into the rear. V.2 employed a series crossover and a nice, if somewhat utilitarian, finish of black rattle-can automotive undercoat, and right now Ivans working on V.3. I think the entire project, all versions included, has cost him less than 300 smackers. Ivan is absolutely delighted with his speakers. Ive had him over to listen to a number of ragingly expensive transducers, and he hasnt liked any of them. While he has a good ear, he much prefers his own Sesler Acoustics V.3.0s. While his strong bias toward his own speakers undoubtedly arises partly from the Proud Papa syndrome, I also believe that Ivan has, by accident or some sort of savant genius, built himself a pair of speakers that sound just right to him. More power to him, I say. Hes gotten off the audiophile merry-go-round. Ive described Ivans travails with a bit of irony, but I admire his dedication, his ingenuity, and his ability to build a reasonable-sounding speaker inside a nearly perfect vacuum of information. I bring Sesler Acoustics to your attention because Ivan inhabits one end of the audiophile spectrum -- hes almost completely absorbed with the gear itself. Ivan loves listening to his own speakers, but I dont think he gets a huge amount of pleasure out of listening to the music itself. While Im still a gearhead who looooooves audio equipment for its own sake, even when its not playing anything, its the music that keeps me going. For me, the end is the most important thing, but if the means to that end are especially cool, then so be it. Sitting in front of me right now is the Gran Viola Signature speaker system from WLM of Austria, and it is the coolest means to the living end. And Im absolutely, 100% sure that the Gran Violas are world-class speakers. Why? Because Ivan doesnt like em. WLM stands for Wiener Lautsprecher Manufaktur (Vienna Loudspeaker Manufacturing). The company was founded in 2002 by Hannes Frick, Martin Schützenauer, and Thomas Gröfler, their stated goal being to reproduce the original recording with the least loss of musical signal. All WLM products are made in Austria. The Gran Viola Signature, which retails for $12,415 USD in the upgraded finishes, and the Duo 18 subwoofer, which retails for $7165 in the topnotch veneers, are WLMs top two offerings. Along with the System Control V crossover ($4750), these components form WLMs statement-level, fully active speaker system. Speakers and sub were delivered in the burled yew finish, which is absolutely stunning. This satin finish consists of perfectly book-matched veneers that appear (and may well be) oil rubbed. Its just as well that these speakers are well-finished, because theyre quite large. The Gran Viola Signature stands 51"H x 10.3"W x 13"D and weighs a reasonable 73 pounds, while the Duo 18 subwoofer measures 31"H x 18.5"W x 18.5"D and tips the scales at a portly 114 pounds. The internally braced enclosures of both comprise multiple layers of birch plywood with a total thickness of 25mm. WLM isnt exactly forthcoming with information about what goes on inside its speakers. Heres what I know. The WLM Gran Viola Signature is, as delivered, a ported, fully active speaker system. 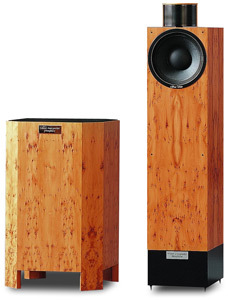 While the Gran Viola Signature is ostensibly a fairly straightforward-looking two-way tower speaker with a separate subwoofer, the enclosures themselves contain no crossovers -- no capacitors, inductors, or resistors. Instead, straight out of the preamplifier, the signal is split into its bass, midrange, and treble components at low levels by active electronic means by the standalone System Control V crossover unit. That done, each frequency range is sent to its own amplifier. I sense rising eyebrows -- yes, the full-on WLM system requires six discrete channels of amplification. WLM does offer passive versions of their speakers, which dispense with the active crossover and replace it with the external Passive Control, which is inserted between preamp and power amp. The Gran Violas drive-units comprise a 10" driver, sourced from Eminence, which serves as the woofer and midrange, and the Super-PAC tweeter system -- at first glance, some sort of curved ribbon or electrostatic tweeter. WLM is tight-lipped about the Super-PACs design, so I feel within my rights to speculate about what lurks within that curved tweeter enclosure. The grille is fairly opaque, so I used a flashlight to obliquely investigate what's going on in there. Each enclosure seems to contain two cone drivers with an apparent diameter of about 1.75". Each tweeter seems to be recessed into a cylinder 1" to 2" deep. These two cylinders dont point straight ahead: one fires in toward the listener, the other outward, toward the sidewalls. Make of this what you will. The 10" midrange-woofer driver has a paper cone and a pleated fabric surround. According to Jody Hickson of Globe Audio Marketing, WLMs North American distributor, the magnets are absolutely massive, which no doubt contributes to their claimed 98dB efficiency. While the fully active version of the Gran Viola Signature is rated to produce bass down to 25Hz, it is rolled off at 80Hz or 90Hz (chosen by a switch on the crossover) and thus has a real easy time of it. The Duo 18 subwoofer is a behemoth, and is larger and heavier than the compressor unit of my central air-conditioning system. Inside the large, well-finished cabinet are two -- count em -- 18" drivers, also made by Eminence. One woofer points upward -- removing the top-mounted grille reveals the bird-bath-sized cone -- and the other downward, firing toward the floor. The Duo 18 is wholly passive -- the amplifier must be supplied by the purchaser -- but, in keeping with WLMs high-efficiency design, the Duo 18 doesnt need that much power. 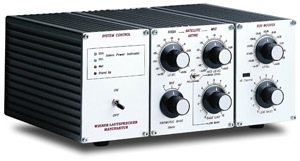 Globe Audio drove one at the 2004 Consumer Electronics Show with one channel of a 40Wpc tube amp. For this review, I ended up using every pair of interconnects and speaker cables, and every power cord, I had in the house, and had to scrounge a few more. I wont list all of them here, but they included wires by Nirvana Audio, Acoustic Zen, Kimber Kable, Shunyata Research, Analysis Plus, Song Audio, and Cardas Audio. If you want the full breakdown, e-mail me and Ill fill you in. I tried a number of different amplification combinations with the WLM system. The only constants were my Anthem P2 Statement amplifier, one channel of which drove the Duo 18; and the Song Audio SA-300M monoblocks, which I used exclusively on the tweeters. The SA-300Ms continue to impress me. I've used them with a number of speakers and their 7Wpc somehow manage to sound wonderful even with the most improbable loads. For midrange power I alternated between an Audio Aero Capitole tube amp and another pair of Song Audio SA-300Ms. The Song Audio 300b amplifiers drove the midranges adequately, giving forth their signature warmth and richness, but to get the high volumes the WLMs were capable of I had to use a more powerful amp. The source, for the most part, was my Pro-Ject RPM 9.1 turntable loaded with a Shelter 901 Mk.II cartridge. My backup Roksan Shiraz cartridge also saw duty. Phono stages were my Ayre P-5xe and the AQVOX 2Ci, while preamps alternated between my own Sonic Frontiers SFL-2 and the excellent Song Audio SA-1. On rare occasions I used my Benchmark DAC1 and Toshiba SD-3750 digital combination. There are few experiences more rewarding than sitting down in front of a new set of speakers and being immediately blown away by the sound. Many times theres a period of acclimatization, during which I slowly accustom myself to the new and, most likely, different manner in which a new pair of speakers presents music Im familiar with. Other times, the initial pyrotechnics soon give way to irritation or dissatisfaction with a bombast that at first seemed so good. Not this time. Jody Hickson of Globe Audio Marketing and I have crossed paths several times in the past. When he came by to install and set up the admittedly complicated Gran Viola Signature system, he already had a pretty good idea of what I listen to and how I like to play it. For your information, Jason likes it loud. So after we got the system up and running -- the process was actually quite painless -- we slapped my Japanese pressing of Pink Floyds The Wall [CBS/Sony 40AP 170-1] on the turntable and Hickson took the controls. The standout track was "Young Lust" -- each whack of the kickdrum rocketed about the room with equal amounts visceral attack and reverberant overtones. This review assignment, I thought, may well be enjoyable. The WLM system played way louder, with way less strain, than any other speaker system of my experience. When the volume was raised, the sound simply got larger, with no change in tonal balance or soundstage. For the first time in my experience, I backed down before the speakers did -- not from any sense of aural strain, or, as Hickson raised the volume higher and higher, any dissatisfaction with how the system sounded. No, I finally cried uncle because pictures were rattling on the walls, and I was truly concerned that one of my neighbors would call the police -- something theyve never done before, even when I had a live band play at one of my parties. By the way, I live in a townhouse, with neighbors on both sides. Is it really appropriate for me to try to describe the tonal balance of a fully active speaker system? Because its possible to monkey with the level, modify the crossover points, and choose tube or solid-state amplification for each driver, youd be somewhat correct in thinking that any descriptions of tonal balance could easily be invalidated by any change of amplifier or turn of dial. Still, the WLM system had some overall characteristics that remained consistent regardless of setting or changes in amplification. First, this was one easy-to-listen-to speaker system. The highs were delicate and shimmering, and the midrange was ever so slightly recessed, though not so much that the imaging faded into the background or lacked in immediacy. Instead, the very slightly reticent upper midrange avoided any glare or aggressive edge, letting me revel in music at louder, more immediately arresting levels than most speakers can comfortably reproduce. Perhaps the WLM systems most endearing feature was the way it could effortlessly accelerate from zero to 100mph in nothing flat. Live music has a dynamic ebb and flow thats generally missing in action from the recorded-and-played-back version, right? Without looking, you can tell when music is live and when its generated by a stereo system. I dont want to delve into the reasons for this deficiency in stereo playback, but suffice it to say that the WLM Gran Viola Signature system got closer to the real, honest bounce, snap, and attack of live music than has any other speaker of my experience. Big words, those, but I stand by them. I listened to Sonny Clarks Cool Struttin [LP, Blue Note/Classic 1588], and the title track, true to its name, bounced along in a tight-knit groove. The WLMs 10" bass/midrange driver seemed to start and stop on a dime, reproducing Clarks piano with almost excessive dynamic contrast. I say excessive because the WLM reproduced acoustic jazz in an explosive manner different from most box speakers of my experience. The WLMs created the feeling of listening to a live band, transporting me to the original venue -- in this case, Id guess, a medium-size studio with reasonably well-damped acoustics. While the dynamic swings were just massive, instruments were reproduced in accurate, appropriate sizes. Art Farmers trumpet, for example, jumped forth with a tiny bit of extra brass from the bell, giving a front-row glossiness along with a life-size image. That big midrange driver hands off to the mysterious Super-PAC tweeter at around 1kHz, which should be well within the midranges comfort zone. Still, thats a fairly low frequency, which means that the tweeters must handle the entire range of 1kHz to the Gran Viola Signatures claimed upper limit of 25kHz -- a tall order for the two small drivers in each enclosure. Overall, the PAC tweeter did an outstanding job, though it did seem to lack just the tiniest bit of extension. Cymbal overtones lacked the ultimate sparkle of a good dome tweeter, but the WLM presented instruments such as guitars and brass with a realistic crispness that didnt fatigue my ears as the volume was raised. Dome tweeters sound realistic at calm, late-night levels, but they can quickly fatigue the ears as the volume is increased. And forget about live levels -- jack up the volume to that found at the front tables of a live jazz club and most domes will tear a strip of skin right off the side of your face. The Super-PAC retained its character as the volume got louder, and actually encouraged me to listen at live levels. The flip side of the WLMs ease with high volumes was its tendency to sound compressed and reticent at low levels. There was definitely a volume setting at which the Gran Viola Signature came alive; below that, you wont get what you paid for. The Gran Viola Signature wouldnt be my first pick for late-night listening in an apartment building. Then again, who in his right mind would buy a system that includes a subwoofer with two 18" drivers for use in an apartment? While the Gran Viola Signature systems imaging, dynamics, and soundstaging were truly superb, what made its presentation of music so special was how well everything was organized: There was no discontinuity between frequency extremes. Although such discontinuity is minimized in many of the best speakers available today, the bugaboo remains, always calling ones attention to the fact that, yes, one is, in fact, listening to a stereo system. In the case of the Gran Viola Signature, such coherence may well have something to do with the low frequency at which the midrange crosses over to the tweeter. That huge midrange driver has to handle only three octaves, which it seems to do so very well. The tweeter is responsible for pretty much everything else. Since it arrived in my house, Duke Ellingtons Piano in the Background [LP, Columbia/Classic CS 8346] has become a staple second only to coffee in its importance. This massive, astounding album sounds as if recorded yesterday, with sound quality to match its musical genius. "Happy Go Lucky Local" finds Ellingtons band in a restrained mood, interjecting atmospheric blats among the rhythm sections delicate melody. Occasionally the brass lets go with a full-throttle charge, and this punctuation adds some rich tension to the mix. The WLM system grabbed hold of every note, placing each instrument in its correct acoustic position along with that notes appropriate overhang and harmonics, while at the same time performing that ultimate audiophile miracle of transporting me directly to the recording session-- each and every time I played this album. What more could I ask? I must also address what that howitzer of a subwoofer brought to the party. The Duo 18 gave me, right here in my room, the best, tightest, deepest bass Ive ever heard -- not just in this room, but anywhere. But that big statement requires some qualification . . . The Duo 18 put forth bass that had width as well as depth. The Gran Viola Signature itself is a full-range speaker, and did a decent job of bass. But whenever I switched the Duo 18 into the system and crossed it over to the Gran Viola Signatures at 80Hz, the sound became so much better -- so much richer, deeper, more realistic -- that I switched the sub back out again only for empirical comparisons. Organ music? No problem. Theodore Duboiss Les Sept Paroles du Christ [Fidelio FACD008] contains some outrageous organ notes, including a couple of instances of 16Hz bass, and is a serious torture test for any speaker. The Duo 18 loaded up my room with intense pressure waves that were truly disturbing, especially when pots and pans began to rattle in the kitchen, one floor up. But the Duo 18 wasnt about bombast. It integrated so well with the Gran Viola Signatures that it was audibly invisible. With the subwoofer switched in, acoustic bass took on a juicy meatiness that fit in perfectly with the music and never overtly announced its presence. Articulate, crisp, fast, and deep, when it wasnt needed the Duo 18 sat there mutely awaiting its cue. At no time could I localize sound as coming from the subwoofer. Bass -- correct, tight, tuneful bass -- simply appeared in my room. There were times, though, when I had to resort to behavior most unaudiophilic -- I had to monkey with the tone controls. Now, dont kick me out of the club just yet -- hear me out. The amount of sheer power available from the Duo 18, and the way the sub could load up the room, pretty much guaranteed that a single setting just couldnt be right for all music. Consciously or not, when you set up your standard all-in-one box speaker, you most likely place it for optimum extension with the least amount of boom. Well, with the WLM Duo 18 there was no such thing as optimum extension. This monster punched down to subterranean bedrock. Maybe if you listened in an auditorium-sized room you might be able to find one specific setting that works well for all music, but Im skeptical about even that. That said, as my listening progressed, I spent much less time futzing with the controls and more time just plain listening. The amount of musical satisfaction the Duo 18 added to the system was off the scale. While Jody Hickson said the smaller Duo 12 or Duo 15 sub would have been plenty for my medium-size listening room, I wouldnt have traded the experience of listening to this beast for the world. To say that I enjoyed my time with the WLM Gran Viola Signature speakers and Duo 18 subwoofer would be an understatement. While its not a cheap investment, especially considering the need for its extensive supporting infrastructure, the WLMs give back full value in the coin of musical satisfaction. If, as I do, you value all the audiophile virtues -- imaging, soundstaging, a reasonably neutral tonal balance -- but have been looking for a speaker that can also engage you with a presentation that is thoroughly involving and dynamically astounding, you owe it to yourself to audition the WLM Gran Viola Signature and Duo 18 subwoofer. This speaker system is one for the ages. Warranties: Gran Viola Signature and Duo 18, five years parts and labor; System Control V, two years parts and labor. All contents copyright Schneider Publishing Inc., all rights reserved. Any reproduction, without permission, is prohibited. Ultra Audio is part of the SoundStage! Network. A world of websites and publications for audio, video, music, and movie enthusiasts.